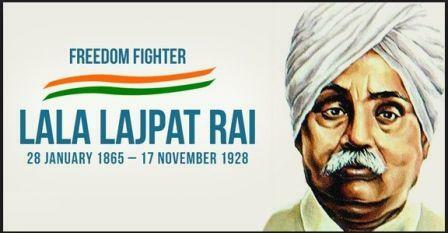 Lala Lajpat Rai was a prominent nationalist leader who played an important role in India’s struggle for freedom. He was a prominent member of the famous ‘Lal Bal Pal’ firebrand trio during the independence movement. His fierce brand of patriotism and potent vocalism against the British rule earned him the title of ‘Punjab Kesari’ or the Lion of the Punjab. He also initiated the foundation of Punjab National Bank. In 1897, he founded the Hindu Orphan Relief Movement to keep the Christian missions from securing custody of these children. He was badly injured in police lathi-charge on the activists, who were protesting the arrival of Simon Commission, and died a few days later due to the injuries. Lala Lajpat Rai was born on January 28, 1865 to Munshi Radha Krishna Azad and Gulab Devi at Dhudike village in Ferozpur District. Munshi Azad was a scholar of Persian and Urdu. Lala’s mother was a religious lady who inculcated strong moral values in her children. His family values allowed Lajpat Rai the freedom of having different faiths and beliefs. He received his elementary education in the Government Higher Secondary School, Rewari where his father was posted as teacher. Lajpat Rai joined the Government College at Lahore in 1880 to study Law. While in college he came in contact with patriots and future freedom fighters like Lala Hans Raj and Pandit Guru Dutt. He studied law from Government College in Lahore and thereafter started his legal practice in Hissar, Haryana. Since childhood he had a desire to serve his country and therefore took a pledge to free it from foreign rule. In 1884 his father was transferred to Rohtak and Lala Lajpat Rai came along. He married Radha Devi in 1877. In 1886 the family shifted to Hissar, where he practiced law. During the 1888 and 1889 annual sessions of the National Congress, he participated as a delegate. He moved to Lahore to practice before the High Court in 1892. Lala Lajpat Rai was a voracious reader and everything he read left a great imprint on his mind. He was deeply impressed by the ideals of patriotism and nationalism outlined by Italian revolutionary leader Giuseppe Mazzini. Inspired by Mazzini, Lalaji became indoctrinated into the revolutionary way of attaining freedom. He, together with other prominent leaders like Bipin Chandra Pal, Aurobindo Ghosh from Bengal, and Bal Gangadhar Tilak from Maharashtra, began to see the negative aspects of moderate politics advocated by many leaders of the Indian National Congress. They voiced their strong opposition to the Congress’ demand for gradual progress to dominion status and began voicing the need for complete independence or ‘Purna Swaraj’. In personal views he was a great believer in inter-faith harmony, but he did not think right of the trend by Congress leaders to sacrifice Hindu interests to appease the Muslim section of the party. Lala was one of the few leaders who realized the difficulties of a united anti-colonial struggle and a possible source of religious conflict between the Hindus and Muslims of the country. His proposal for "a clear partition of India into a Muslim India and non-Muslim India" on December14, 1923, in The Tribune, met with major controversy. Lajpat Rai gave-up his legal practice and put all his efforts towards freeing his Motherland from the shackles of the British Imperialism. He recognized the need for presenting the state of affairs in the Indian Freedom struggle to prominent countries in the world in order to highlight the atrocious nature of the British rule in India. He went to Britain in 1914 and then to the USA in 1917. In October 1917, he founded the Indian Home Rule League of America in New York. He stayed in the USA from 1917 to 1920. In 1920, after his return from America, Lajpat Rai was invited to preside over the special session of the Congress in Calcutta, (now Kolkata). He led fiery demonstrations against the British in Punjab in protest for their brutal actions at Jallianwallah Bagh. When Gandhi launched the non-cooperation movement in 1920, he plunged into action leading the movement in Punjab. When Gandhi decided to suspend the movement post Chauri Chaura incident, Lajpat Rai criticized the decision and went on to form the Congress Independence Party. The Simon Commission visited India in 1929 with the aim to discuss constitutional reforms. The fact that the Commission was comprised solely of British delegates greatly angered the Indian leaders. The country erupted in protest and Lala Lajpat Rai was in the forefront of such demonstrations. On October 30, 1928, Lala Lajpat Rai led a peaceful procession to oppose the arrival of the Simon Commission in Lahore. Intercepting the march, Superintendent of Police, James A.Scott ordered his police force to 'lathi-charge' at the activists. The police targeted Lajpat Rai, in particular, and hit him on the chest. This action left Lala Lajpat Rai with severe injuries. He died of a heart attack on November 17, 1928. His followers squarely placed the blame on the British and vowed to avenge his death. Chandrasekhar Azad along with Bhagat Singh and other associates plotted the assassination of Scott but the revolutionaries shot J.P. Saunders, mistaking him as Scott. Not only Rai was this heavyweight leader of the Indian Nationalist Movement, his views on patriotism and nationalism earned him the status of a venerated leader. He inspired young men of his generation and kindled latent spirit of patriotism in their hearts. Young men such as Chandrasekhar Azad and Bhagat Singh were driven to dedicate their lives for the sake of freedom of their Motherland following his example. Lala Lajpat Rai made lasting impression in the minds of his countrymen not only by his leadership abilities, but made his presence felt in fields of education, commerce and even healthcare. He was a follower of Dayanand Saraswati and helped establish the nationalistic Dayanand Anglo-Vedic School. He initiated the established of a bank which later evolved as the ‘Punjab National Bank’. He established a trust in his mother Gulabi Devi’s name in 1927 and oversaw the opening of a tuberculosis hospital for women named Gulabi Devi Chest Hospital.